With Windows 2008 Microsoft introduce new way of printer mapping called Easy print, as the name implies this makes terminal session printing really easy. It will map clients locally installed printer to the terminal server session and the terminal session user only have to do is click print, printed document will receive in client site printers. That is the success story of the easy print but there are far worst side, That is the slowness of printing, Easy print use XPS document that will download to the client computer, and this is some times very larger than the printing document, if your client session is connected from a remote low bandwidth location, definitely it’s going to make client life miserable with the slowness of printing. I have faced this and I found the solution is to move to old conventional way of printing with Remote desktop services, this is how you do it using Windows server 2012 Remote desktop services. Edit the following group policy objects to make Easy printing as the second priority. You have to do this on all remote desktop host servers if you have a farm. 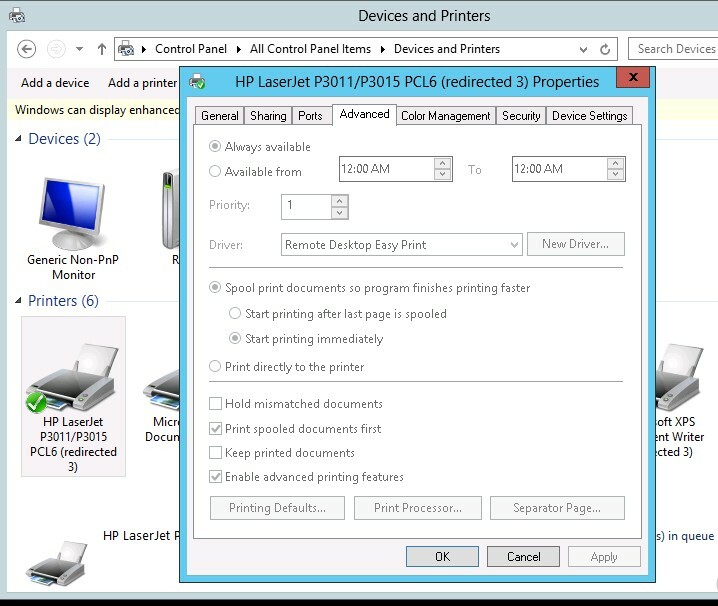 This will make Easy printer driver use as the second option, it will not going to disable easy printing. To work with the conventional printing, you have to install the exact same client’s printer driver on the Session host Server. 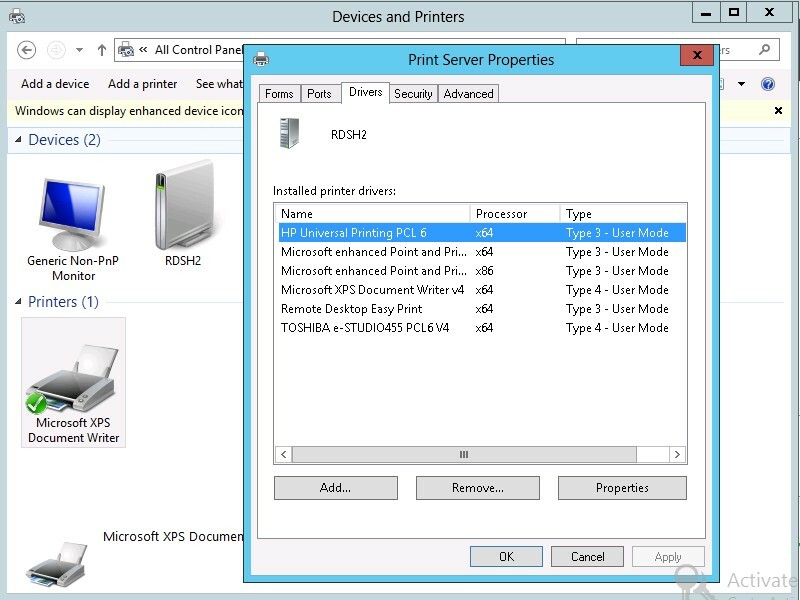 Easiest way to install the clients same printer driver to server is share the printer in client side , and access it from the server, when accessing the driver will be copied to windows server 2012 session host server. Then using the add printer add the correct printer driver to the server. 4. Printer driver should be set to real printer device driver not as Easy Print Driver. Mapped printer with client’s printer driver, your redirect printer should look like this. 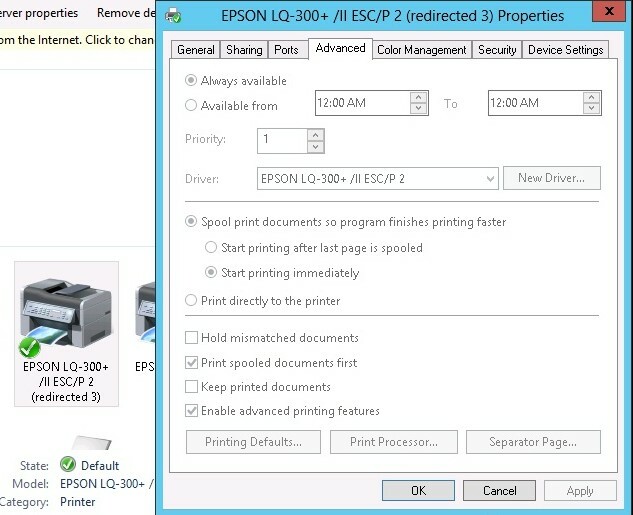 If you have installed correct drivers, printer driver will be mapped in advance view of printer properties. If the client computers is having different printer drivers, all of those drivers required to add in to the session host server. If the client is having 32 bit drivers, those drivers also required to be in the windows server 2012 or 2008R2 server. Hope this is useful … cheers. Azure Automation | Start | Stop | Virtual machines.